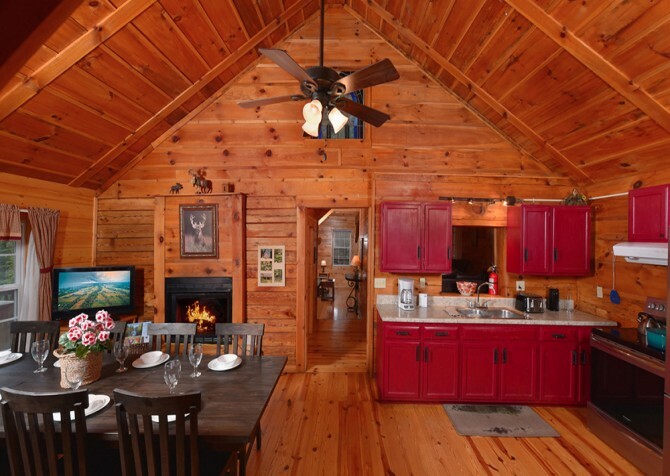 Slip away to Keaton's Streams and Dreams, a lovely 4-bedroom, 3-bathroom cabin by Cove Creek with 3,500 square feet of space for up to 14 guests. When you’re not exploring downtown Pigeon Forge, ziplining through the trees, or shopping and dining at The Island, you’ll have this welcome space to call home — for relaxing and playing. 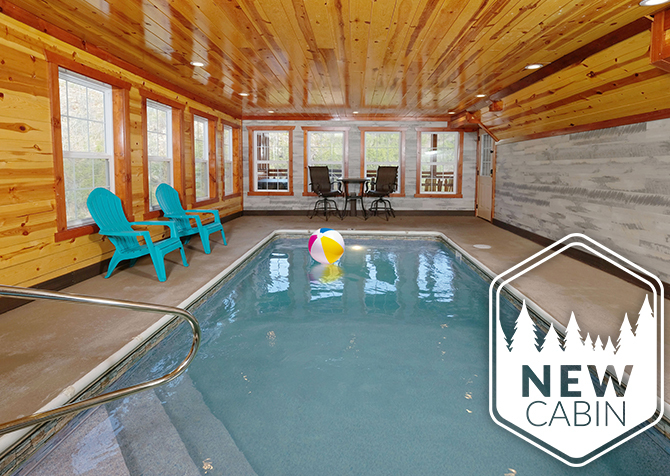 From games to the conveniences of home, this large-group cabin is equipped with everything you need for a fantastic stay in the Great Smoky Mountains. Gather around the electric fireplace to play board games (found in the cabin), or flip on the big screen TV and just hang out. You’ll even have a Blu-ray player, so rent from Redbox or bring your favorites from home! As you unwind, take advantage of high-speed wireless internet in the cabin. At night, the bedrooms await with 1 king-size bed, 5 queen-size beds, and 1 twin-size bunk. There are also TVs in every bedroom, so there will be no fighting over the remote! Add on conveniences like the washer and dryer and fully equipped kitchen, and you’ll feel right at home with your group here. Outside, sit back in the rocking chairs with your morning coffee or end evenings in the soothing outdoor hot tub. On nice days, be sure to take advantage of the charcoal grill for cookouts at the cabin! Want more? Enjoy an indoor jetted tub and flat, paved parking for easy unpacking and arrivals at Keaton’s Streams and Dreams! Venture into the cozy and spacious living room, inviting to all with 3 large sofas, 2 ottomans, 2 arm chairs, and a rocking chair. Leave your luggage behind, flip on the big screen TV, pop in your favorite Blu-ray film, lay out a smorgasbord on the coffee table, and start your vacation as soon as you arrive! As the evening sun sets and chilly mountain breezes brush past, get a toasty fire going in the heated, electric fireplace, adorned with stone and a beautiful mantel piece. It’s the best place for late-night chats with your bestie, midnight cocoa, a good read, or all of the above! Just of the living area rests the kitchen, fully equipped with all the tools and appliances you need for hot breakfasts, lavish lunches, evening feasts, and midnight munchies. Outfitted with stainless-steel appliances, including a double-door refrigerator, dishwasher, stove, double sink, and a microwave, you’ll enjoy the ease of creating Grandma’s secret recipe at Keaton’s Streams and Dreams. There is also plenty of counterspace, great for meal prep and arranging snacks for nibblers throughout the day. And the best part is this cabin provides not only a coffeemaker but also a Keurig, so you can whip up whole pots or single servings of joe at the press of a button. As a bonus, Keaton’s Streams and Dreams has a den (aka the second living room) just downstairs, featuring bright red furniture against gorgeous wood paneling around the room. The large area rug, ceiling fan, and most importantly, the big screen TV make the space a great escape for the youngsters in your group. Set up a provided board game on the coffee table for game night or knock back a few cold ones with your best pals. After playing in town and at the cabin all day, a cozy bed to lay your head will be just what you need! 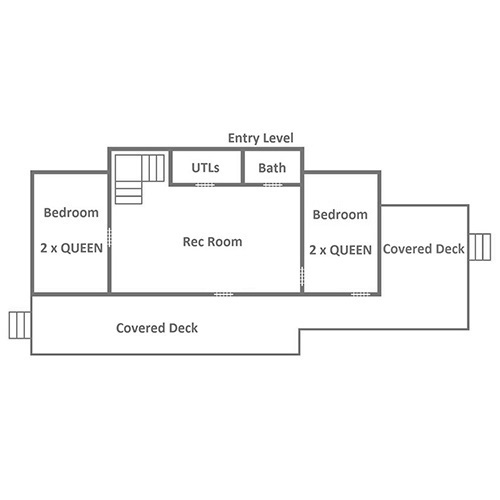 Climb into the king-size bed in the master suite, where high ceilings, a large sofa, and direct deck access (to the hot tub!) await. Sneak in morning soaks before the gang awakens or lounge in bed until noon with the mounted flatscreen TV. Not to worry, every bedroom comes with a large, mounted flatscreen TV, so everyone can enjoy a bit of entertainment before they hit the hay. 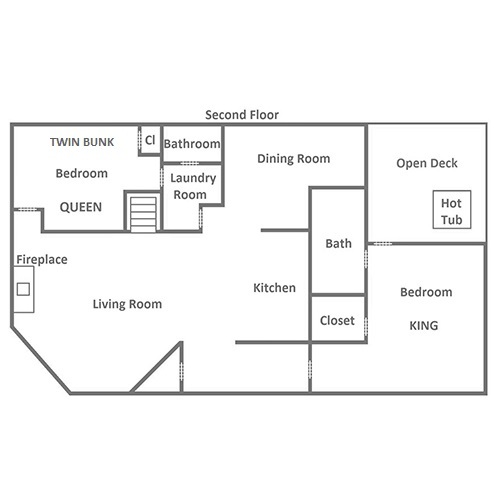 In 2 other bedrooms, you’ll find 2 queen-size beds in each, and the last bedroom boasts 1 queen-size bed plus a twin bunk. There’s also a jetted tub in one of the 3 bathrooms, meaning spa baths are only a bath bomb away! Multiple relaxing outdoor spaces can be found at Keaton’s Streams and Dreams. Hop into the bubbly hot tub after a day’s hike through the national park, unwind with tranquil wooded and flowing river views from cushioned outdoor seating, sip morning coffee at the outdoor tables, rock away your worries and cares in the gliders, and prepare barbecue feasts on the large, picnic-style, charcoal grill! This semi-private cabin also boasts a flat, paved driveway with parking for up to 6 vehicles, so everyone can travel to and from the cabin in comfort. Located in a resort, Keaton’s Streams and Dreams is within a short walk from the communal gazebo on the river with rocking chairs, great for morning devotionals or simply reconnecting with nature. The cabin also offers high-speed wireless internet, complimentary to you, and a washer and dryer so you can pack light this trip. Less than 6 miles to the hustle and bustle of downtown Pigeon Forge, Keaton’s Streams and Dreams keeps you far enough away from city lights to enjoy nature yet close enough to make in to your dinner show in record time. Soar through the trees with a smile at Wears Valley Zipline Adventures, less than a 1-minute drive from the cabin! Find the wall art, jewelry, outdoor décor, soaps and lotions, and more at Aunt Debbie’s Country Store — beautiful and rustic to the core!